This beautiful rolled dessert has a salted caramel cream cheese filling and is the perfect homemade gift for giving at Christmas. 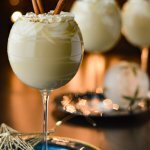 You’ll find this to be one of the most decadent desserts during the holidays and is a nice addition to your Thanksgiving table. Your family and friends will rave about how delicious this beauty is when sliced and served. Every year, during this holiday season, I wonder to myself “What have I gotten myself into?” I’m a crazy woman when it comes to Christmas gifts. I can’t help myself. I know I have an issue, but I’m okay with that. When I did a “love language” test years ago, the results proved my number one love language is “gift giving.” It was not a surprise to me. I love making gifts to give away at Christmas time that originate from my humble kitchen. A tradition that I began probably 30 years ago and has continued every year since is baking pumpkin rolls and delivering them to our friends around the city. I have an original Pumpkin Roll recipe from an Oklahoma State University Extension Center cookbook. I worked at this extension center back in 1982 shortly out of high school. I actually typed out, copied and assembled this cookbook. 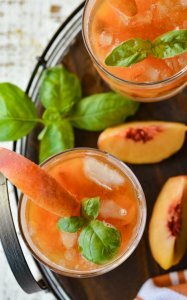 Ladies from across our county submitted their favorite recipes. Just recently, I pulled from my cabinet this cookbook and noticed the publish date is 1983. To this day, it is one of the most cherished cookbooks in my recipe arsenal. Okay, back to the crazy woman – I kid you not, one year I baked over 40 pumpkin rolls to give away. You seriously would have thought a tornado cut through my kitchen by the time I had finished. This year is proving to be not quite as ambitious. I think I ended up with about 23. But I have to admit, I think the same tornado hit my kitchen again. It makes no difference to me though because I find such joy in the moment. As I’m baking these little gems to give away as gifts my whole “happy” heart is going into them. Anybody that knows me, has figured out that the actual gift is great but the presentation is everything to me. And although the wrapping will most likely end up in the trash can, I find great joy in bestowing a beautiful package that hides the actual gift itself. 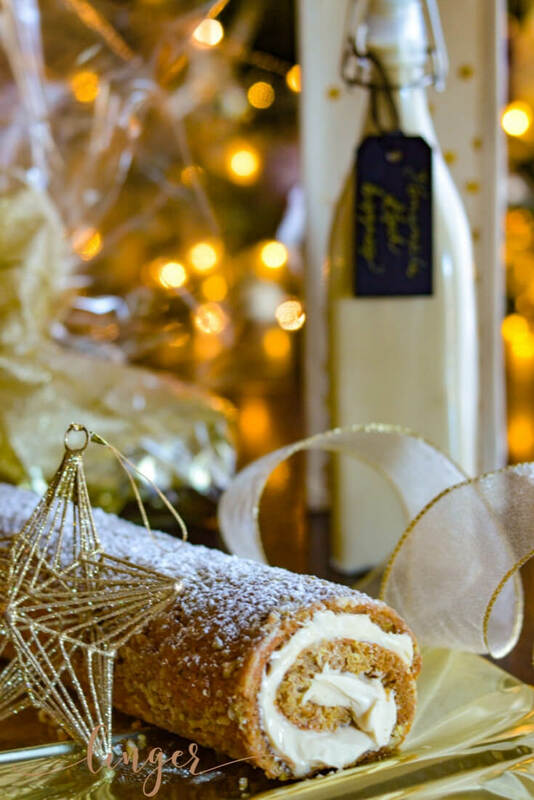 This year I wrapped the Salted Caramel Pumpkin Roll in gold mylar paper, used a large piece of clear cellophane to draw up around it and tied each of them with a shimmering gold bow. The finished decoration was an actual ornament that could be used on their tree. One thing I did differently this year which I am really (REALLY) excited about is adding a little bonus for my friends. 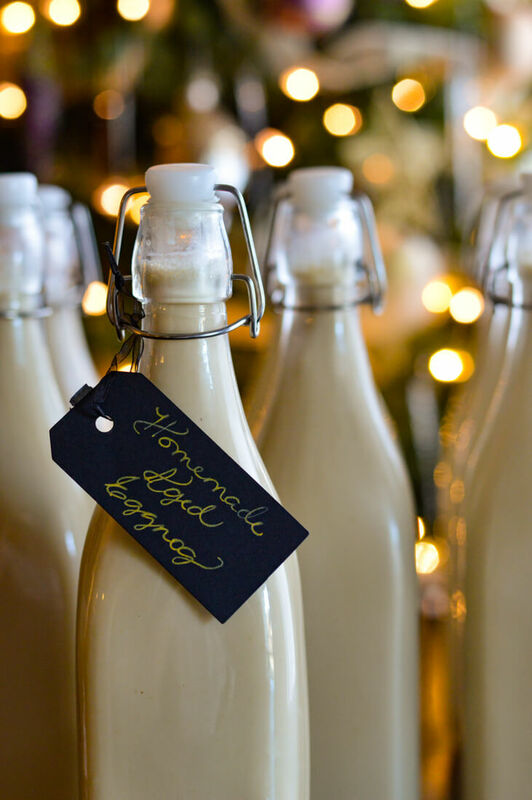 A little “boozy” bonus – Homemade Aged Boozy Eggnog. They are gonna really (REALLY) love me. The eggnog has been aging for about 1 1/2 months and (of course) I had to taste test it to make sure it is good to go. And, oh boy, is it ever boozy. 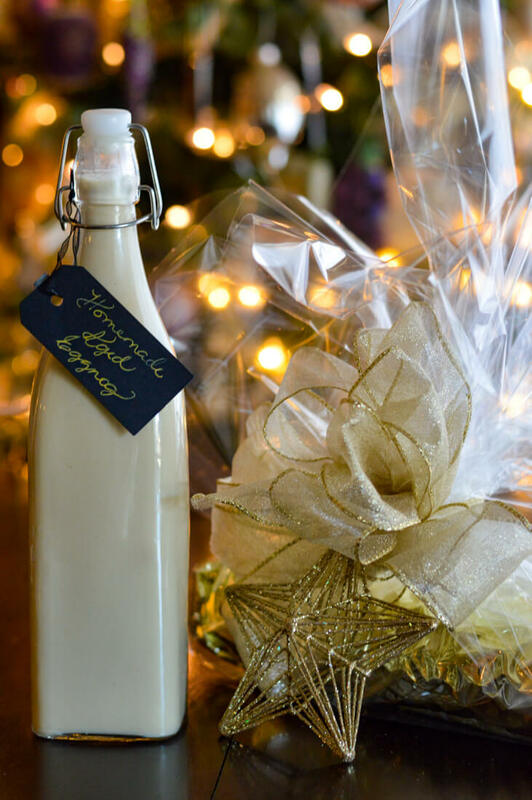 I bottled the eggnog in tall milk-like bottles that I purchased at Hobby Lobby and then concealed them in beautiful cloth wine bags that I found at Home Goods. I’m almost giddy as I wait for the weekend so we can finally deliver these goodies. 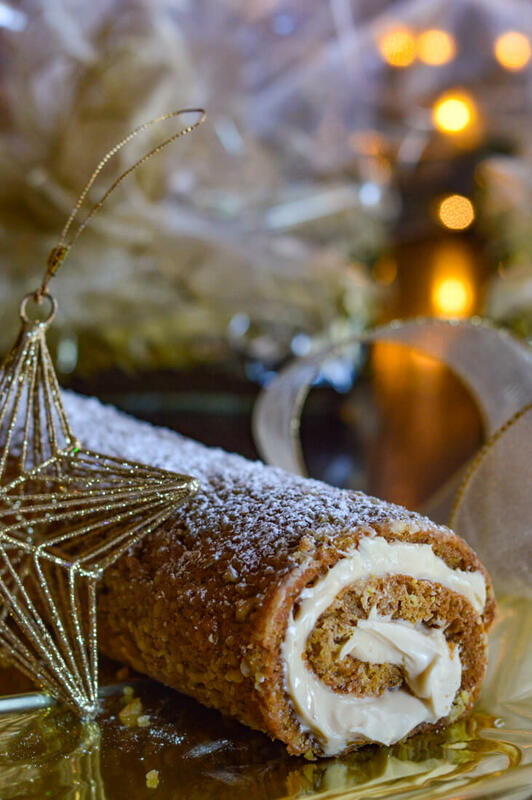 I have made so many of these pumpkin rolls over the years, that I honestly think I could make them in my sleep. So if you would like, I could give you some helpful hints that I have learned through many a trial and error. Make sure and beat the eggs for the full five minutes. Beating the eggs adds air into the cake batter and gives it a light and fluffy finished product. If you are making more than one, don’t double or triple the cake recipe. I thought it would save me time but I wasn’t as happy with the results it gave. I use freshly grated nutmeg, mainly because I love it. You can use the ground spice in a jar and it will turn out just as good. Use 1 teaspoon of ground nutmeg or 3/4 teaspoon of freshly grated nutmeg. Fresh nutmeg has a more potent flavor. Use a 11×17 inch cookie sheet. It seems to be the best size. Believe it or not, I have used the same cookie sheet for 30 years. Line it with foil and spray the heck out of it with Pam making sure to get the sides well coated. Pecans or walnuts both taste wonderful with this cake. I like to have some coarse pieces mixed in with the finely chopped nuts. The original recipe calls for one cup, but I always use a heaping cup and sprinkle them over the top of the batter. The batches that I just finished baking took exactly 14 minutes each in a 350° F oven. Every oven is different though. I would suggest checking it at around 10 minutes and going from there. It is done when you gently press the cake with your finger and it feels springy and pillowy. A dish towel works great for rolling up the cake. Generously sprinkle it with powdered sugar. When the cake is done, flip it quickly onto the towel and roll from the narrow end. Make sure and let it cool completely before you unroll it. Then frost immediately and re-roll. The frosting – you can definitely double this recipe. I actually multiply it by five when I am making pumpkin rolls for gifts. The original recipe is a cream cheese icing. 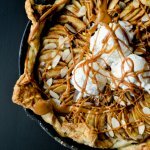 This year I changed it up a bit and created a salted caramel icing and it turned out wonderful. 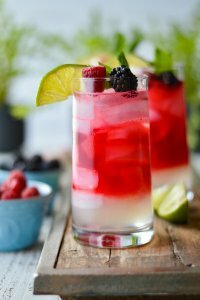 This recipe freezes great. Therefore you will always have a gift to pull out in case someone stops by to wish you a Merry Christmas. Merry Christmas and A Prosperous New Year to You and Yours!! 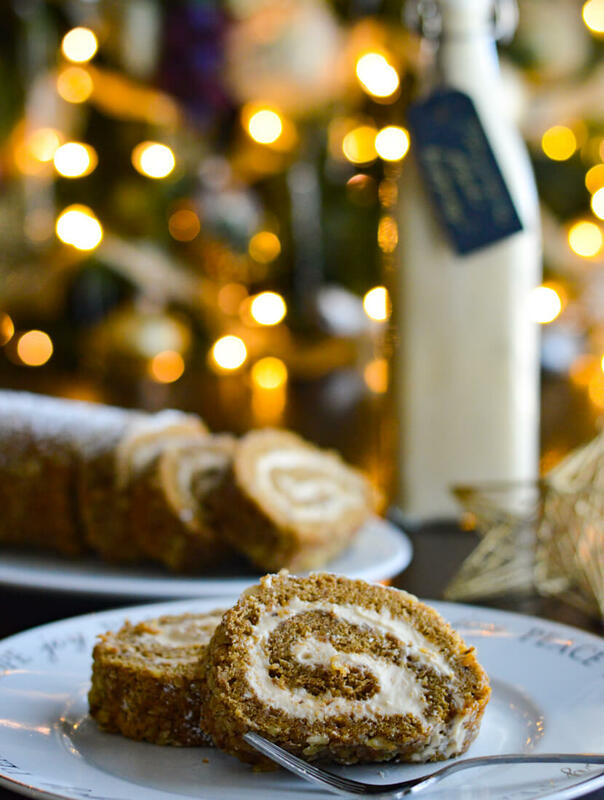 I hope you enjoy baking this Salted Caramel Pumpkin Roll as much as I have over the years. Bake extra and give them away as gifts the holiday season. Maybe it will become a tradition for you as well. Merry Christmas and a Prosperous New Year to you and yours!! 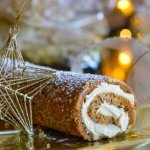 Salted Caramel Pumpkin Rolls – This beautiful rolled dessert has a salted caramel cream cheese filling. 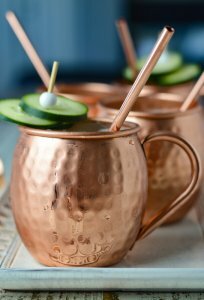 A perfect homemade gift for giving at Christmas. Preheat oven to 350° F. Foil and grease a 11×17 inch cookie sheet. In a medium bowl beat the eggs on high speed of mixer for 5 minutes. Gradually add in sugar. Stir in pumpkin and lemon juice. In a small bowl, combine all of the dry ingredients and whisk together. Gently fold the dry ingredients into the pumpkin mixture. Spread the batter into the greased cookie sheet and top with the finely chopped nuts. Bake for 13-15 minutes. Turn out on a dish towel generously sprinkled with powdered sugar. Starting at the narrow end, roll towel and cake together. Let completely cool. Unroll and fill. In a medium bowl, beat the cream cheese and butter until fluffy. Add salted caramel. Beat the powdered sugar in one cup at a time until fully combined. Add vanilla. Spread the filling over the unrolled cake. Roll and chill for at least one hour. 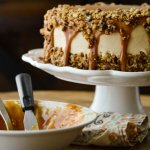 Pecans or walnuts both taste wonderful with this cake. I like to have some coarse pieces mixed in with the finely chopped nuts. The original recipe calls for one cup, but I always used a heaping cup over the top of the batter before it goes in the oven. 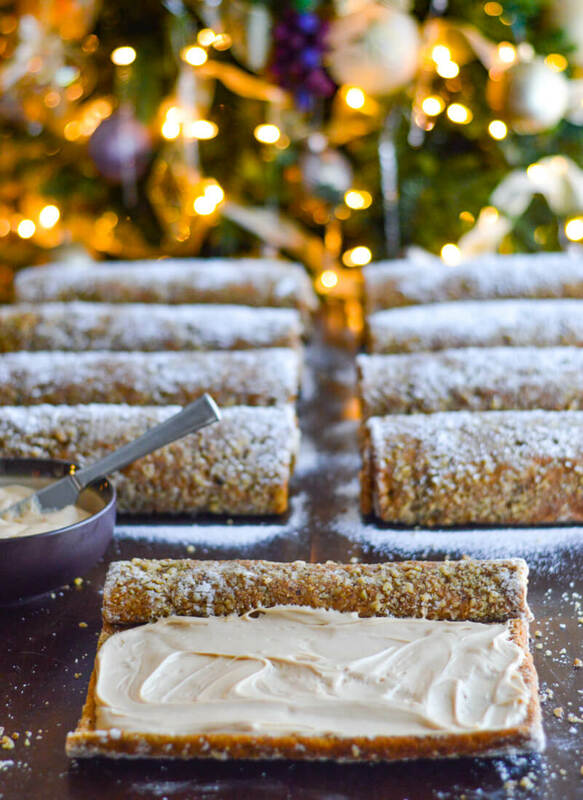 The frosting – you can definitely double this recipe. I actually multiplied it by five when I am making pumpkin rolls for gifts. The original recipe is a cream cheese icing. This year I changed it up a bit and created a salted caramel icing and it turned out wonderful. 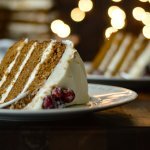 This is seriously the go to pumpkin recipe for Christmas. My wife has made them more times than I could ever count for homemade gifts.